An extensive collection of ITIL key performance indicators (ITIL KPIs) supports the introduction of a comprehensive framework for process control. This includes regular quality assessments of the IT Service Management processes. ITIL key performance indicators (ITIL KPIs) are used to assess if the processes of an IT organization - the ITIL processes - are running according to expectations. Defining suitable KPIs is above all about deciding what exactly is considered a "successful process execution". Once this is established it becomes possible to determine and measure specific indicators. Process Owners and Controllers are thus in a position to evaluate the quality of their processes, which in turn is the basis for the ongoing optimization and fine-tuning of the process designs. The selection of suitable ITIL KPIs will, among other things, depend on the possibilities to actually measure the indicators. The KPIs and the corresponding measurement procedures are therefore an important input for system requirements. Generally, the exact definitions of the KPIs will differ depending on the nature of an organization. There are, however, a number of typical KPIs used to assess ITIL processes. Those common indicators are presented on the following pages as a complete collection of KPIs for the most important ITIL processes. The suggested ITIL key performance indicators (KPIs) comply with the ITIL 2011 recommendations and were enhanced with elements from COBIT . 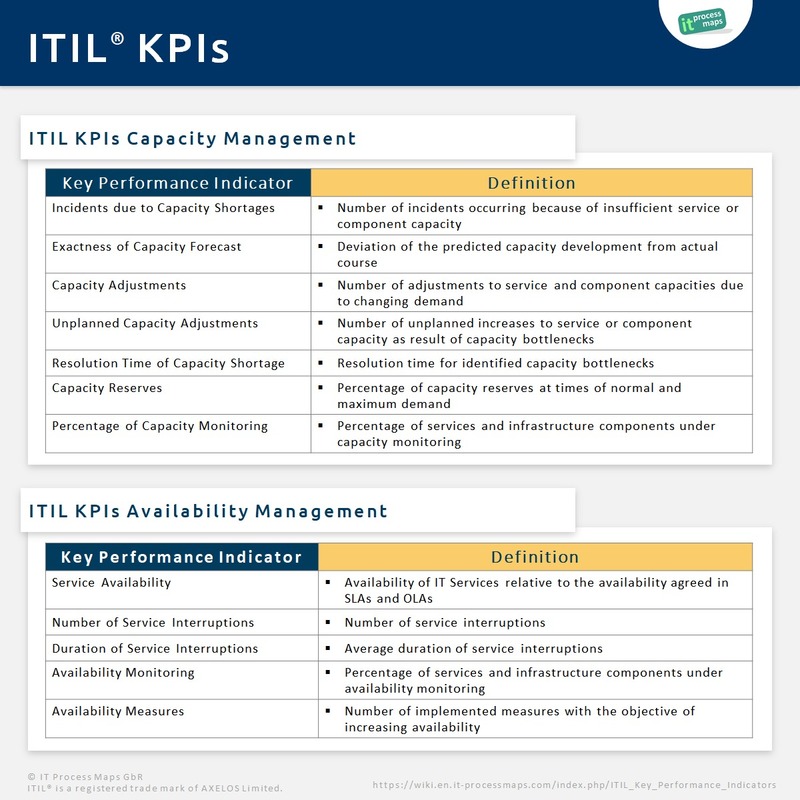 More suggestions for suitable KPIs can be found in the official ITIL publications. "COBIT" is a Trademark of ISACA (Information Systems Audit and Control Association). This page was last edited on 29 March 2019, at 18:53.